Seoul & Los Angeles (March 21, 2018) – CJ 4DPLEX, the world’s leading 4D company, is launching “4DX with ScreenX” to create the next revolution of immersive cinema. A combination of the fast-growing 4DX and ScreenX cinema formats, the new concept is being showcased in the U.S. for the first time at CinemaCon, taking place April 23-26 in Las Vegas. Currently being sneak previewed at one theatre in South Korea (and an Edison Award finalist), “4DX with ScreenX” utilizes the motion chair and environmental effects of 4DX and the 270-degree, multi-projection panoramic visuals of ScreenX. A video of the auditorium in South Korea can be found here and a high-resolution photo of the experience can be found here. “4DX with ScreenX” and “4DX VR” – along with other new, futuristic concepts to be announced at a later date – all demonstrate the company’s vision of a “cinematic experience beyond expectation,” and will be showcased by CJ 4DPLEX in Roman Ballroom II at Caesars Palace. Set to become the fastest premium format to reach 500 screens in April (just seven months after becoming the fastest to reach 400), 4DX eliminates the boundary between the audience and the film with motion chairs that move in perfect synchronicity with the movie being shown on-screen. The immersive theatre technology, launched by CJ 4DPLEX in 2009, uses effects to simulate wind, water, light, fog, scent and more, making people feel like they’re in the movie. 4DX is available today in 10 U.S. locations, with dozens of new screens already confirmed to be coming to the country in the near future. 4DX currently reaches 492 locations worldwide, with the format finishing 2017 by having increased the number of screens equipped with 4DX by 37 percent year-over-year. ScreenX is the world’s first multi-projection theatre technology, created in 2012 by CJ CGV, part of CJ Group, to enhance the movie environment by allowing moviegoers to go beyond the frame of the traditional movie screen. It utilizes a proprietary systm to expand images of feature films and pre-show advertising to the left and right walls of the theatre, creating an immersive, panoramic, 270-degree experience. It has been installed in more than 140auditoriums around the world, including three in the U.S., with more to come this year. Also at CinemaCon, CJ 4DPLEX is introducing its future cinema concept, 4DX VR Cinema – the world’s first virtual reality cinema which implements VR-exclusive feature films, short films, promotional movie trailers, games and other entertainment content at 4DX theatre auditoriums. VR will finally be installed in movie theatres, with head-mounted device (HMD) packages available as an add-on option for any 4DX auditorium. This will allow exhibitors increased business opportunities beyond feature films, providing a new layer of excitement to customers. Additionally, the company is taking 4DX beyond the auditorium, with the new 4DX VR Interactive Racing , 4DX VR Sports – Board Type and 4DX VR Disk units making their U.S. “premiere” at CinemaCon. These three products take 4D and VR beyond the auditorium and into the lobby, and are being offered to exhibitors as a “Lobby Entertainment All-In-One Package.” 4DX VR brings additional revenue opportunities by allowing patrons to experience alternative content in theatres, either before or after they watch a feature film. · 4DX VR Disk – allows people to explore 360 degrees of virtual reality without having to place their feet on the floor, and rotates horizontally to give the feeling of actually being in a particular environment and able to move around freely. For photos of the 4DX VR units coming to CinemaCon 2018, click here. Location Information: Roman Ballroom II on the Promenade level (2nd Floor). Press interested in setting up an appointment to demonstrate the above and/or interview an executive at CJ 4DPLEX should contact Kevin Broderick at kevin@lippingroup.com or 323-965-1990. CJ 4DPLEX (www.cj4dplex.com) is the world’s first 4D cinema company, headquartered in Seoul with international offices in Los Angeles and Beijing. The company created 4DX, the first and leading 4D cinema technology for feature films, providing moviegoers with an immersive, multi-sensory cinematic experience, allowing the audience to connect with movies through motion, vibration, water, wind, snow, lightning, scents, and other special effects that enhance the visuals on-screen. CJ 4DPLEX brings 4DX auditoriums to exhibition partners along with 4DX codes for both major Hollywood blockbusters and local titles, as well as content ranging from concerts to commercials. 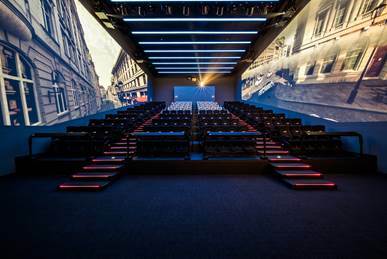 Each 4DX auditorium incorporates motion-based seating synchronized with more than 20 different effects and optimized by a team of skilled editors, maximizing the feeling of immersion within the movie, beyond the limits of audio and video. Since 2009, more than 500 Hollywood titles have been screened in 4DX. To date, more than 59,000 4DX seats operate in 492 auditoriums spanning 57 countries.